An elderly gentleman sitting quietly in his armchair reading a newspaper-- could there be a less exciting subject for a drawing? Well, that depends on the artist. Look how Searle has re-invented the human form: posture in the shape of a question mark; a sagging mouth that exceeds the limits of the face by extending all the way down to the jawbone; and legs like matchsticks. with what may have been a bamboo stick, giving them the character of rotting timber. The hands have no bones, yet the gnarly lines grasp the newspaper perfectly. Searle's drawings always contain valuable lessons, but the one I'd like to emphasize here is that the subject matter does not necessarily limit the quality and originality of form. In an era where so many artists are convinced they don't have to draw well as long as their concepts are cool, Searle is a welcome reminder of the opposite truth: that quality in visual form can stand alone, proud and tall. I don't know the drawing's context, but the resonance between the heavy curve that is both his back and a weight on his back, and the curve of back of the newspaper he is holding (which is drawn as being near insubstantial) is striking. The opposing dynamic in the comparative stiffness of the dog's back and that of the (solid) paper it is reading adds to the excellence of the piece. Also, is the man actually reading his own paper or is he casting a sideways (backwards? glance at the dog and/or the dog's paper? I adore Ronald Searle's work David, and I'm delighted you've included him in your blog. 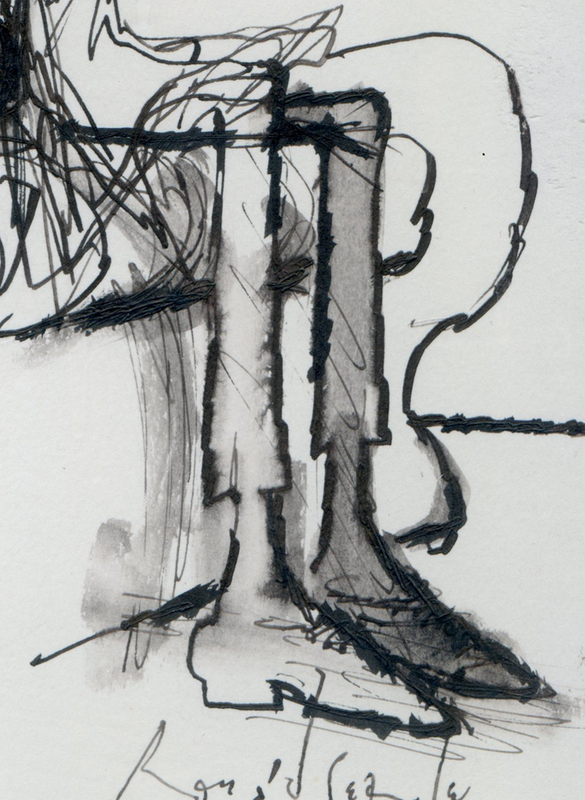 This is a fine drawing built with the cobwebs, claw marks and spilt ink of his style. Searle is brilliant! He draws the way the old man FEELS rather than the way he LOOKS. Searle's comic energy was unstoppable. Maybe it was the champagne. I guess there's a lot of similarities between deeply funny minds. They all seem to express this wasteland of idiocy and malevolence we call the human experience through an unflaggingly childlike buoyancy. 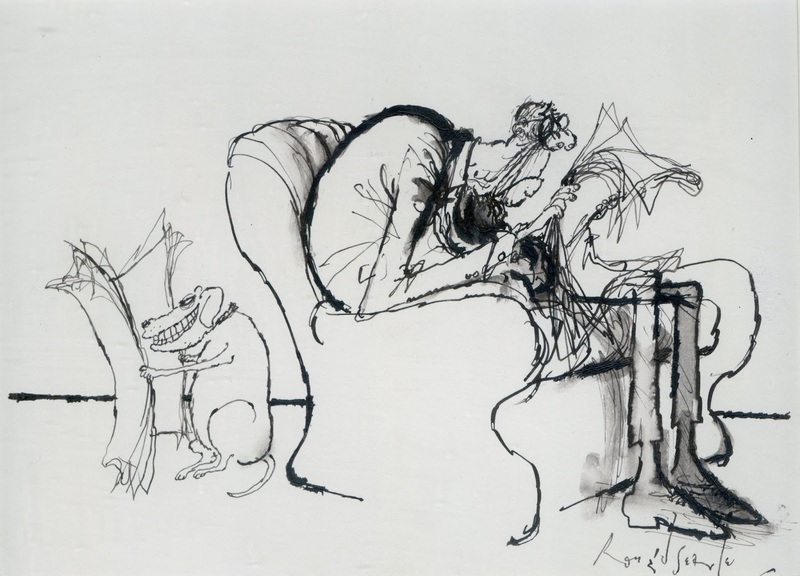 In Searle's shabby world, everybody's ridiculous, prickly, and grotesque. And everything we make is trash. But, he can't help but add, be of good cheer anyway! I don't know if he was the first of the breed that gave us Drucker, Levine, Davis, and Coker Jr, but I wonder if we'll ever see these kinds of artists again? I don't see how one can manage to turn slovenliness into a unique and personal style without using real physical pigments and materials. I like your point "quality in visual form can stand alone, proud and tall." Is this another way of proposing the opposite of Tom Wolfe's pushed-to-the extreme thesis of Modernism in "The Painted Word" where the concept needs no art at all? Can it be that a wonderfully-done drawing or painting needs no concept? Actually, that's normally the case for still lifes and landscapes, though it's possible to work in some social or political commentary. It gets trickier where humans are added to the subject matter. But a Sargent portrait can easily be appreciated for its aesthetic and technical merits without getting into the intellectual weeds of the sitters clothing and social position. 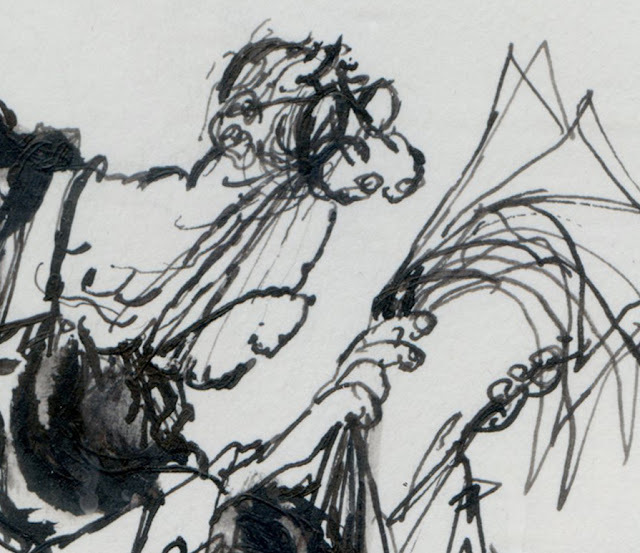 As for Searle, I got hooked on him eons ago via his St. Trinian's cartoons. Quirky point: Next week I'll be staying at the Hotel de Fleurie in Paris, the same place Searle often used (they used to have a drawing he made for them in the lobby). I would say, anything "wonderfully done" must be positively resonating with conception. I agree with Donald , I too liked your point that, "quality in visual form can stand alone, proud and tall." As Kev points out that "anything "wonderfully done" must be positively resonating with conception," strikes me as the exact reason "visual form can stand alone, proud and tall." Technique is such an expression of conception that they almost seem inseparable. When an artists understand what they are doing their work can take on an utter casualness and simplicity so much so, that what they produced looks like it grew, like a flower. It's a casualness that can almost look sloppy which to me implies it is more important where you place a line then how how you draw it. I always like Searle's sketchbooks especially his Pairs Sketchbooks, lots of drawing form life tends to bring truly new things into the world as nature seems to delight in creating form. Thanks for the "lovely drawing," David. Here is a post on his working methods that I found interesting. Beauty is inherently demonstrative to the intuition.